One of the kids here brought out her own rifle to show it. 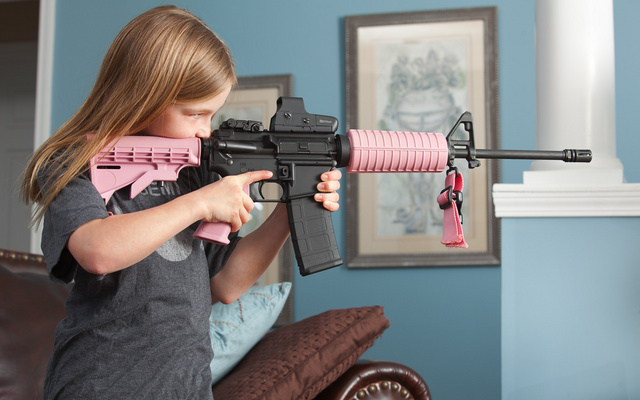 The girl is nine and the runt of her age group, but it turns out that the AR15 is neither too heavy nor too complicated for her to operate — contrary to what the know-in-all VP claims. EOTech holosight works great for getting around cross eye dominance. This entry was posted in interesting people, pink, rifle, self-defense, training, weapon and tagged 223, AR15, girl, optics. Bookmark the permalink. Note the eevuul adjustable stock. Fully collapsed, it helps her take a much better shooting stance. Don’t mess with the little one! Is there some point I’m missing to the state of the sling, which appears to have been simply cut off? If you do not cut your sling you are sooo nineties. You do not know much about making a fashing Statement, do you? The sling wasn’t cut. It has a clip there and has been removed. The sling was interfering with stance and the photo. She needs a Hello Kitty decal on the side of the mag well. She has as much determination in her finger as she does in her eye. Good teacher. I was thinking she cut the sling because it was in the way, which would add to the ‘war face’ scene. Now I see the clip. Thanks for the tip to the EOTech sights. We just discovered my wife is cross-eye dominant. Any 1x illuminated sight, reflex, holographic or otherwise, takes care of that issue very well. But mostly they make sighting a lot faster and easier no matter the situation. Practice helps too. I was strongly cross-dominant until I forced myself to sight with my strong side eye later in life. Now I’m closer to ambi-sighted. In any case though a person should practice weak hand shooting with the weak side eye and strong side shooting with the strong side eye. Or so I believe. If that is a .223/5.56 gun and she can hold minute-of-bad-guy, works for me. I wonder if an SBR would drop the weight enough so she could run her grip further out? As I remind my students, there isn’t a firearm made that’s anywhere near as complex as a TV remote, and we seem to handle them alright. Then again, there’s a big difference between “simple enough for normal humans” and “simple enough for someone as stupid as Joe Biden”. It’s entirely plausible that most guns are too complicated for that dimwit. It just needs green, glow-in-the-dark hydro-printed zombie skulls overprinted on it to make it perfect. And with that adjustable stock, she’ll be able to shoot the same gun when she is older, unlike those short little .22’s (which my daughters also like.) Very little recoil, nice choice for the size/age. That is an ADORABLE shot. How much safer would our children be if they all received such training at such an age? And that’s a very good grip she’s got on the mag-well. We used that a lot in Iraq. Quick to bring up to the shoulder, good side-to-side control, and (if your arms are long enough!) easy to switch out to the foregrips if you want the stability for a longer ranged-shot. Judging by her grip, expression, and stance, she’s welcome on any range I’m RSO’ing any time. Any idea where the pink sling came from? I have been looking everywhere for one for my wife’s AR.